Just another greasy road wi-what? *sigh. A tired Canucks team ventured into Los Angeles to take on the Kings and potentially exorcise their playoff demons from 9 months ago. Playing their third road game in four nights, and fourth game in six nights, Vancouver put their best foot forward by scoring two goals in the opening 25 minutes. However, fatigue got the better of them, as the Kings scored twice to tie the game, and carried the majority of play for the second half of the contest, leading to a shootout victory. Roberto Luongo: Bobby Lu kept his team in the game through two periods, making several sparkling saves on terrific chances in close. 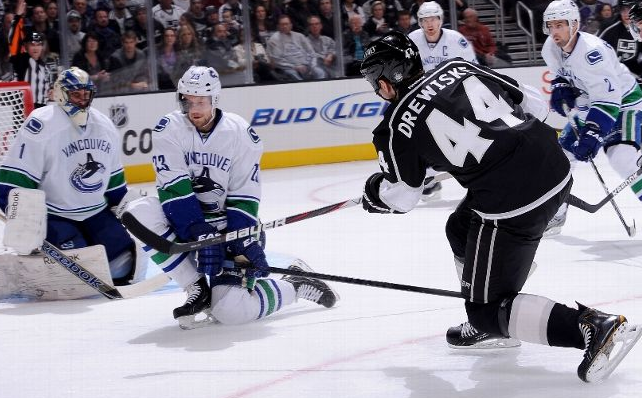 Zack Kassian: Somehow the big man managed to keep scoring without any points from the Sedin twins. Kassian notched his fourth goal in five games and continued to be a physical presence. Alex Burrows: Playing center? no problem. Burrows was as good as any Vancouver center on faceoffs tonight (not very) and contributed a goal, tied for the team lead with four shots on net and was the versatile forward that the team needs him to be. Sedin Twins: Once again, the twins produced goose eggs on the power play, and also spent more than their fair share in their own end of the ice. They certainly were not horrible tonight, but they were not part of the solution. Special Teams: Once again the Canucks had two third period power plays to put the game away, and once again they came away with nothing. Veteran, skilled teams are supposed to take advantage of those opportunities, alas, such is life for the Canucks in January. The powerplay was 0/3 and the PK gave up a goal to a woeful Kings power play that had not scored all season. Alain Vigneault: Sure the team was tired, but he's been frustrating in his attempts to sit back and ride out victories. It hasn't worked yet this year. And why would it? You've got Henrik Sedin, Alex Burrows and Jordan Schroeder as your top three centers, and you're playing Malhotra 10 minutes a night. What's worse? AV insists on throwing Edler out there in the shootout. The lanky Swede is now 6/20 overall. This game had it all! Great goaltending, inconsistent officiating, and a skills competition. If you're a Canucks fan, it also had the 2013 trend of sitting on two goal leads and failing to convert PP chances. On the bright side, the Canucks stepped into the Stanley Cup Champions barn for their fourth game in six nights and walked away with a point. On the other hand, they squandered a 2-0 lead, multiple opportunities to seal the deal, and a terrific goaltending performance from Roberto Luongo. Take a day off, practice the power play for god's sake, take Edler off the shootout and find some more offense. How's Kesler doing anyways?? ?